2. Remove the clamp in front of the muffler and separate the exhaust at the slip joint. 3. Remove the hangers from the rubber insulators (five in total) and remove the exhaust from the vehicle. If a hoist or hydraulic lift is not being used the tail pipe may need to be cut to clear the rear axle. NOTE: This system does not require the removal of the spare tire. 1. On Quad Cab models only, install the expanded end of the extension pipe over the factory exhaust system behind the "Y" pipe and install muffler onto extension pipe. On Regular Cab vehicles, install muffler onto the factory exhaust system behind the "Y" pipe. 2. Place hangers located on muffler into factory rubber insulators. 3. Loosely install the driver side over axle pipe. This pipe will connect to the outlet closest to the drive shaft. 4. Feed the passenger side over axle pipe over the axle and install it loosely. 5. Feed the expanded end of the driver side tail pipe from the rear of the vehicle over the axle and connect it to the driver side over axle pipe. 6. Move the driver side tail pipe into approximate position. Using the factory hole provided in the frame located directly above the tail pipe hanger, attach the hanger provided using the supplied hardware. 7. Remove the factory rubber insulator for the factory tail pipe. Now feed the expanded end of the passenger side tail pipe from the rear of the vehicle over the axle and loosely connect it to the passenger side over axle pipe. 8. 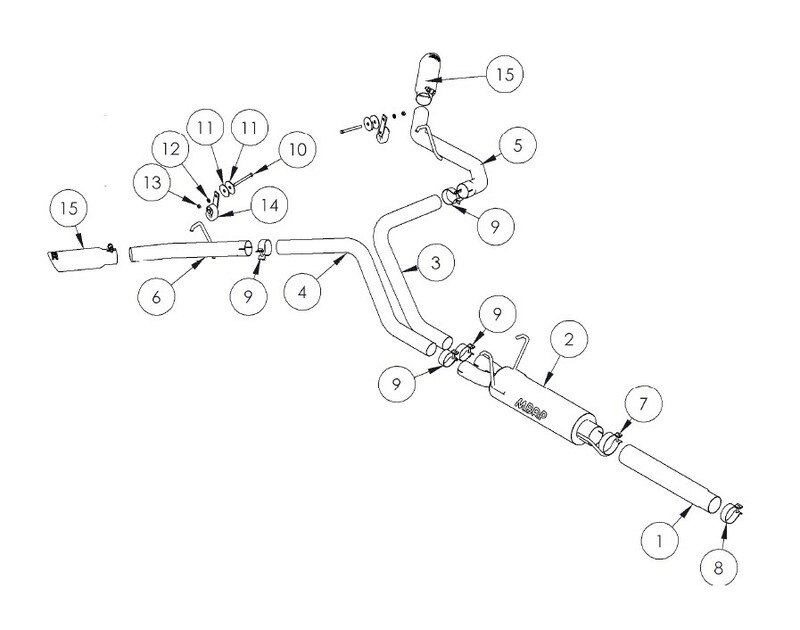 Move the passenger side tail pipe into approximate position. Using the factory hole provided in the frame located directly above the tail pipe hanger, attach the hanger provided using the supplied hardware. 9. Install the mirror polished tips. It is recommended to install them at this point to assist with the final system alignment. 10. Install the hanger clamp around the front muffler joint and into the factory rubber insulator located on the frame near the front of the muffler. 11. Install provided clamps to the pipe connections where required. Align the exhaust as required before tightening clamps. 12. Starting at the front of the exhaust tighten all clamps and connections. 13. Check along the whole length of the exhaust system to ensure that there is adequate clearance around the spare tire, fuel and brake lines or any wiring. If any interference is detected relocate or adjust. Congratulations! You are ready to begin enjoying the improved performance and driving experience of your MBRP Inc. Cool Duals system. We hope you enjoy your purchase.